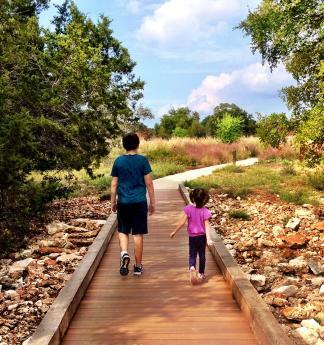 The Lady Bird Johnson Wildflower Center is a favorite place to explore for families visiting Austin. Learn more about the new Family Garden and plan your trip to the Wildflower Center on the Austin Insider Blog. The 4.5-acre Family Garden is the only native plant garden developed for families in Central Texas. The area includes more than a dozen interactive features made of natural materials including a maze made of native shrubs, giant tree stumps and limbs for kids to climb on, giant birds&apos; nests made from grape vines, a grotto with caves and a waterfall, an expansive lawn of native grass, dinosaur footprints, a creek offering water activities and more. My family visited on a warm afternoon and my 4 year old loved playing in the creek with the supplied watering cans and buckets. Mom tip: make sure you bring a change of clothes in case your kids splash so much that they get wet. In addition to the Family Garden, my kids loved exploring other areas of the Wildflower Center. Climbing the tower to see the view of the surrounding grounds and checking out the butterfly garden is always on our list. The Wildflower Center is an affordable way to spend time. Children 4 and under are free and children 5 to 12 are only $3 (teens, students and adults are $9). The Wildflower Cafe offers breakfast and lunch items, but you are welcome to bring in food to eat in the picnic area. The Center also hosts great holiday events including Luminations, happening December 13 and 14. To learn more about the Family Garden and the Center itself, visit www.wildflower.org.